When it comes to Long Island NY home improvements, sometimes, improvements can be as simple as checking existing items for safety and making necessary repairs to prevent someone from getting injured. Aging deck structures are on this list of things you need to check around your home. Harsh storms, high temperatures, and a lack of general routine maintenance can increase the risk of deck injury. 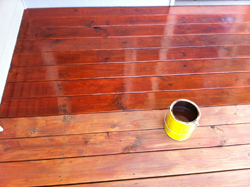 Just keeping your deck sealed with a good deck sealant will go a long way towards preventing rot and decay of the wood and structure. There are more than 40 million decks in the United States that are more than 20 years old or older, according to the North American Deck & Railing Association, and hundreds of reported deck accidents occur annually. How often you need to make Long Island NY home improvements and repairs to your deck will depend a lot on the materials used to build your deck, the age of your deck, and how well you’ve maintained your deck over the years since it was built. Get more home improvement tips by checking out the “Long Island NY Home Improvements” section of our site under “Long Island NY Real Estate Categories”.